Solving the visual symbol grounding problem has long been a goal of artificial intelligence. The field appears to be advancing closer to this goal with recent breakthroughs in deep learning for natural language grounding in static images. In this paper, we propose to translate videos directly to sentences using a unified deep neural network with both convolutional and recurrent structure. Described video datasets are scarce, and most existing methods have been applied to toy domains with a small vocabulary of possible words. By transferring knowledge from 1.2M+ images with category labels and 100,000+ images with captions, our method is able to create sentence descriptions of open-domain videos with large vocabularies. We compare our approach with recent work using language generation metrics, subject, verb, and object prediction accuracy, and a human evaluation. 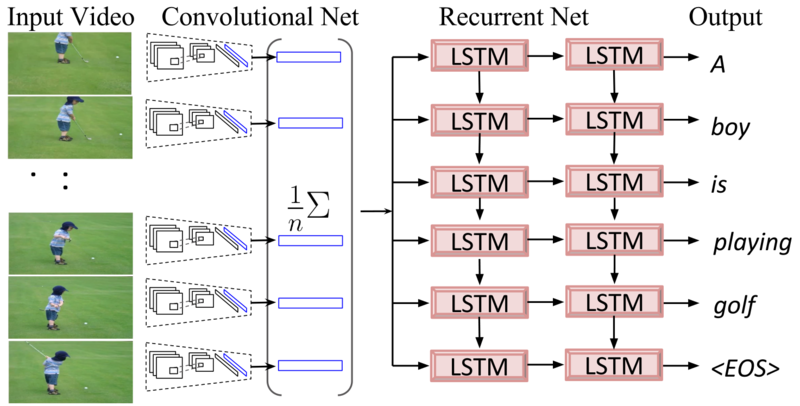 An overview of the CNN-LSTM video to text translation model. Sample Youtube clips with model output. The pre-processed data contains VGG (16 layer) network's fc7 activations mean pooled across frames of each video, and the sentence descriptions accompanying all the videos. This data can be used directly with the code to train a network. The models are currently supported by the recurrent branch of the Caffe fork in my repository or Jeff's repository but is not yet compatible with the master branch of Caffe. The METEOR score of this model is 27.7% on the Youtube (MSVD) video test dataset. (refer to Table 2 in the Sequence to Sequence - Video to Text paper). Also consider citing Long-term Recurrent Convolutional Networks for Visual Recognition and Description.